From my last post you may have guessed that I try not to do my hair everyday. For me it can be a challenge when my hair is in its Afro texture. So here are my buns dos and don’ts for when I’m all about the bun life.Not that the rules don’t get broken. Buns are perfect. They can be as conservative or as messy as you like. For the first few days I wore a high bun with a twist down the center for an extra flair. I actually wore that bun for three days.Buns can be a protective style if your careful. My first Do is to make sure your hair has moisture before putting your hair in a bun. Especially if you plan on keeping it in.Your hair is tightly wound which means no matter how much you spray your hair it won’t get to the ends of you hair or even the inside of the bun. 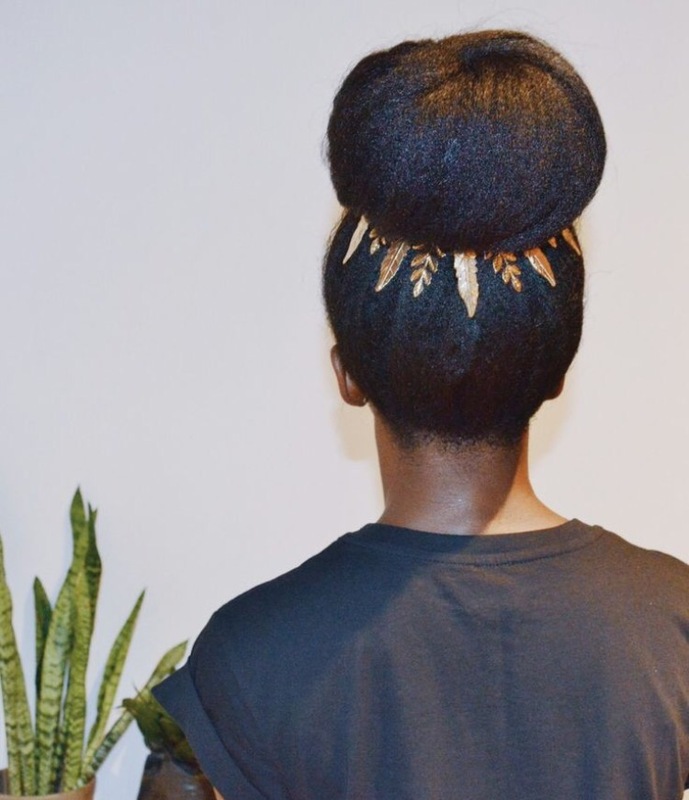 Don’t be afraid to oil your hair and seal your ends. If your hair is wet even better add a leave in.Keeping your hair moisturised no matter the style is always a do for me. Another do for me is to wear a scarf. A Silk scarf is best for me. A bonnet just doesn’t cut it when I’m wearing a bun. If your going for a sleek look around the edges of your hair a silk scarf will keep them in place as you rest.What you don’t want is to have to constantly brush the edges of your hair. If your goal is to wear it as a protective style over manipulating defeats the purpose. A hard don’t is wearing buns that are extremely tight to bed. With that said I just avoid wrapping the hair tie more than once or twice. The less tension I put on my hair the better. If it’s not sitting right well that’s what hair pins are for just don’t over do it. No matter how fierce and how much life my bun is giving me it can’t stay in for ever. A don’t for me is leaving it in more than a few days. The inside of your hair needs to be moisturised. Also you want to avoid the knots that are the result of leaving in a bun way too long. When you take your bun down after a few days it doesn’t have to mean forever. It could be to oil and do some light detangling. It could be as simple as finger detangling your ends a little with your oil of choice. After that bun life is a go again. Three days is my max. I understand that everyone’s hair is different. You may be able to leave it in for longer but baby I don’t need that kind of drama. I am not going for the one long lock down my back no shade. Hopefully you feel me on that. Hey a girls got to do what a girls gotta do okay! One thing that will always be a do for me with buns is being creative. Wearing a bun up top or two buns or even decorating the front of your hair with braids or twist or even hair jewelry which any girl loves.Getting creative with your hair is always a win. Remember, be happy, be curly, be you, and you will never fail! This Post was posted in Hair care, natural hair, naturlhairstyles and tagged #bunlife, #buns #bunlife, #issabunday, #naturalhaircommunity, #protectivestyles, #teamnatural #naturalhairstyles #bunlife #issabunday, natural hair. Bookmark the permalink.